Today is Friday which is normally a day I would rejoice seeing as how I live for weekends but not this Friday though. I woke up this morning to the sad news of Michael Jackson's death. To say I was shocked is putting it mildly. I rushed over to the PC and read the news she was pointing out to me, I was in a daze for a while. I grew up to the tunes of the man. I danced to his music and spent countless hours perfecting his moonwalk with my cousin just so I could show off that I could pull off one MJ's dance moves. The man was a legend. The King of Pop they called him. It's so sad to know he's no longer going to be around. But that's life. At least his music will still live on forever. its so sad.. huhuhu.. he IS one of the greatest entertainers around. I grew up listening to him and I truly was a huge fan ever since I was like 5. Anny - Yes, it's really a sad day. I'm still walking around in a daze. He touched so many peoples lives ... I still can't believe he's gone. Rozella - Same here. I rushed over to wifey's side when she told me the news to see for myself! Rozella - Same here la. To me, he's just irreplaceable and the world will be different without him in the industry. Nessa - Yeah, I'm really sad. They're playing one of my favourite MJ song's, Man in the mirror now and I feel macam nak nangis ... uwaaahhh! Why is it that all the good ones die young? Like Elvis and Lennon...now MJ as well. Im sad too..very sad actually!! Maslight - Amen to that. Alting - It is, it's a HUGE loss for the world of music entertainment. Kadusmama - I think the whole world is sad. I don't know of anyone who hasn't heard of him. I actually found out about this off the Net. Yes, the passing of a legend is felt all over the world. btw, glad you're back. how's the back? Ronald - Shows you how profound an effect he had on all of us. Actually the back is still acting up, but I can't stay away from blogging for too long ... LOL! it seems that everyone is writing about him.. his time has come.. yeah, it a big shocking moment to the world of music. Marzie - He most definitely will! I know I'll miss him. Fyzal - I guess it was written somewhere that his time was up. Foong - Amen to that brother! Nice post...I was saddened by the news, too. Now I can't help but cry when I hear his songs. He was a very special person. He definitely made a mark in this world. He most definitely did. There will never be another Michael. Nick, the man died but his work remains. That's what I always say. Cidao - I agree. His music will outlast us all. 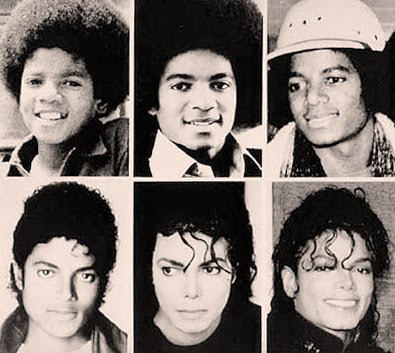 I like how you discolored the MJ pics so as to lessen his horrific self-bleaching of the past 20 years. You wouldn't have left your kids alone with this freakazoid in a thousand years, and you know it. Anonymous - I wouldn't trust my kids with anyone mind you but I'm talking about the man's talent here, which is HUGE mind you, and not his personal life. We all have our quirks and 'freakazoidness' but unfortunately we're not as popular as MJ.